Parsnips and New Mace: Silkworm Pupa? 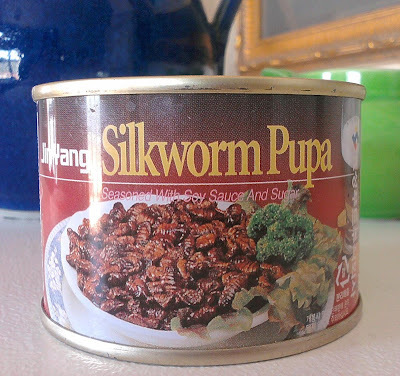 Silkworm Pupa. You sometimes have to be prepared for anything when visiting your favorite Asian grocer. Recalling my general science days, I believe the pupa comes right after the 'larva' stage in some insects.... It's coming upon little shocks as this that made me start saying to myself, "What the H-mart?" -- which is the name of my favorite shopping place. Looking at the ingredients you will indeed find that the first and foremost is, 'Chrysalis'. Yep. I sat this up on a shelf in our kitchen for awhile. It was quickly found to be a source of curious conversation, as well as a handy weapon when dealing with a defiant child. "I'll tell you what. You can take 2 days of being grounded -- or you can eat a can of silkworm pupa...which would you prefer?" The can remains unopened. But with 20grams of protein packed into this 4.12oz tin, I'm sure there's a delectable purpose for this product (?) I just wish I knew what it was. I might even try it -- and video the event. P.S. : It's seasoned with soy sauce and sugar. Crunch away!